Several thousand workers are marching in key cities tomorrow to commemorate Bonifacio Day, demand a ban on contractualization and protest the hero’s burial of Marcos. Meanwhile the militant Partido Manggagawa (PM) today slammed the Department of Trade and Industry (DTI) for a statement that foreign firms will pull out if contractualization is banned. “The DTI is just parroting the usual capitalist blackmail when workers make demands that dent their profit. Firms, foreign or local, want contractualization because it is a way to cheapen labor costs by denying them job security and the opportunity to unionize and bargain for better wages and benefits,” argued Rene Magtubo, PM national chair. The nationwide Bonifacio Day rallies by the labor coalition Nagkaisa are billed as a “National Day of Action Vs. Endo.” PM together with other labor groups are rejecting the so-called “win-win” solution on contractualization and pushing for “end endo” formula of prohibition of subcontracting of regular jobs. “The misnamed win-win scheme of the employers and DTI will not end endo. It is a scam that will lead to the utter proliferation of outsourcing and contracting out of regular jobs by the principal employers,” explained Magtubo. Member groups of Nagkaisa will assemble tomorrow 8:00 a.m. at the Welcome Rotonda and then march to Morayta where it will hold a program. Militant workers will then join advocacy groups for another rally around noon at Mendiola to register labor’s condemnation of the surprise hero’s burial for Marcos. PM and Nagkaisa are also holding mobilizations in key cities tomorrow. In Cebu City, workers will march from downtown Colon to Plaza Independencia. Industrial and sugar workers are going to rally at the Bacolod marker Araneta. 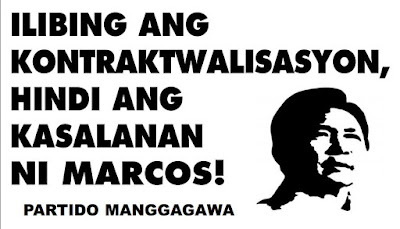 In Davao City tomorrow, workers are marching from the Freedom Park to the Bonifacio Monument. PM also expressed doubt on the announcement the Department of Labor and Employment (DOLE) that 25,000 contractual workers have been made regular. Instead PM revealed that the DOLE has not been able to enforce regularization of workers in numerous instances. The militant group said that there is a Japanese-owned electronics factory in the Cavite ecozone that has refused to regularize hundreds of its agency workers despite an order from the DOLE. It cited the case of the PALEA 600 who have not been reinstated by Philippine Airlines as regular workers despite a settlement agreement that provides for it. Finally PM also pointed out the case of 149 Pizza Hut contractual workers who were retrenched when they sought regularization but have been reinstated only as agency workers. “It seems that the news of 25,000 newly regularized workers is fake similar to posts in Mocha Uson's controversial blog,” Magtubo said.